An easy way to think of marketing is like a big umbrella in which the various parts of your overall marketing strategy fall under, such as advertising, social media and public relations. Some of the world’s most celebrated and well-known companies—think Apple or Coca-Cola—have been successful using two simple tactics: make great products and market them well. 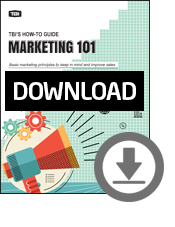 TBI’s Marketing 101 Guide: Basic marketing principles to keep in mind and improve sales, is an easy-to-reference (and printable) guide to help partners to boost their own marketing efforts and better understand marketing strategy as well as best practices for everything from when to send an email to how to interact with prospects on social media. Download the guide now and see for yourself how invested TBI is in educating our partners in all aspects of their business, from back office support to marketing.